What Are The Biggest Cargo Vehicles? 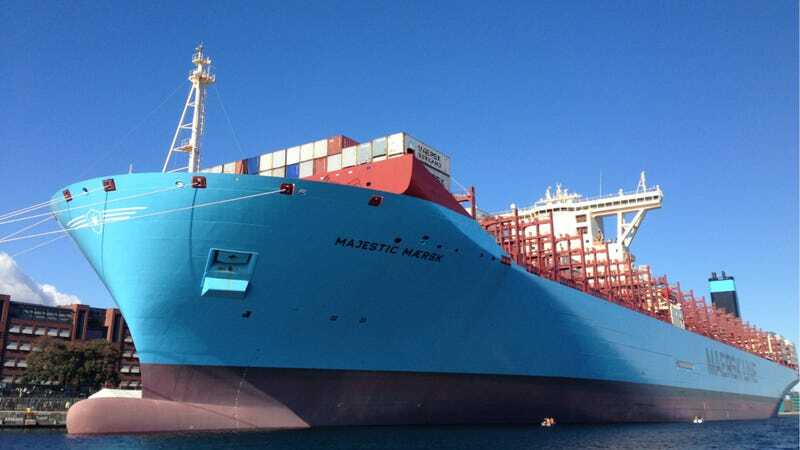 The Maersk Majestic set sail on its maiden voyage the other week, and it is currently the title holder for "World's Largest Container Ship." It's not the largest ship in the world, though, or the largest ever made, which would be the Seawise Giant. And it can't exactly go on land or in the air. So what are the world's biggest cargo vehicles? Cargo transportation, like many things, benefits from economies of scale. If you ship a lot of things at once, it can get a lot cheaper. That's why the Maersk Majestic was built, to ply the busy trade routes between Europe and Asia. Over a quarter of a mile long, you can transport 18,000 containers. Or create a drag strip, either one, really. But probably more of the containers thing. I can think of a number of candidates already for different categories, but I'll let those candidates and categories be up to you. So what do you think? What are the biggest cargo vehicles in the world?